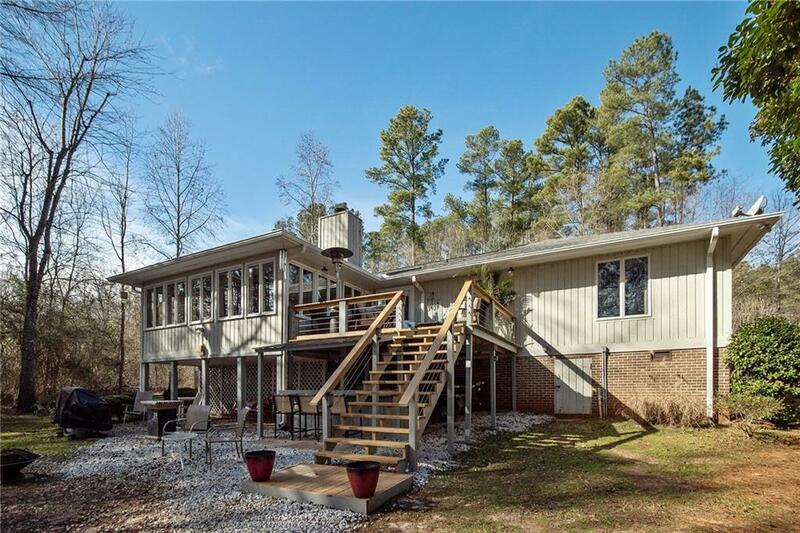 This spacious Lake Hartwell waterfront home sits on the lot you've been dreaming of -- a level walk from the house to the water, 100' of water frontage, and in a wide cove just off Coneross Creek. Centrally located between Seneca and Anderson, Shenandoah is a restricted subdivision with no HOA. Just off Hwy 24, this is a great spot for those wanting a quick drive to Clemson or I-85. At approximately 2300 square feet, this home falls into the hard-to-find "just right" category in terms of size. Interior features include a large living area with vaulted ceiling and fireplace with gas logs, a recently completed sun room overlooking the lake, formal dining room with built-in buffet, designated office/study with built-in cabinetry and desks, and a walk-in laundry room. Beautiful granite countertops, stone tile backsplash, and new stainless steel appliances are among the updates made to the kitchen. The large master suite includes a private adjoining bathroom with double sinks and a separate area for bathing, as well as a walk-in closet. One of the additional bedrooms has a walk-in closet, and the full bathroom in the hall has an oversized vanity and private bath area with a walk-in tile shower. On the back side of the home is a newly added deck with stainless steel cable railings and a wide staircase to the back yard. Beneath the deck, you'll find a large bar area which was also completed within the last year. At the end of a completely level walk from the house, you'll find a 23x30 covered dock with a 60' wheeled gangwalk. Additional highlights: roof replaced in 2015, supplemental baseboard heating throughout, comfort height toilets in all 3 bathrooms, updated cabinet hardware throughout, Andersen casement windows throughout, hardwood floors in sun room, ceramic wood look tile in dining room, laundry, & bathrooms.